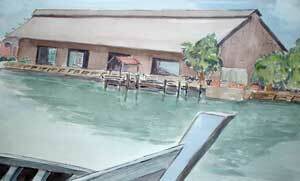 This is a slightly larger sketch of the godown by the Malacca rivermouth. The godown was used to store charcoal and mangrove logs that were imported from Indonesia. This godown, now abandoned, sits at the rivermouth opposite the present maritime museum.